While gasoline is like the food that fuels your car, the battery is the spark of life that actually gets it going in the first place. Without that initial jolt, your car might as well be a multi-ton paperweight. There are specific exceptions, where it’s possible to start a car without a battery, and some small engines don’t use batteries at all, but the fact is that when your car battery dies, you’re going nowhere fast. There are different values of dead that a car battery can exhibit, so the exact symptoms aren’t the same in every situation. If your car exhibits one of the following telltale hints, then you might be dealing with a dead battery. No dome light when opening the door or no door chime with keys inserted. If the battery is totally dead, you won’t hear a chime or see the dome light at all. If the battery is very weak, the dome light may appear dim. Alternate causes: Faulty door switch or fuse. Headlights and radio won’t turn on, or headlights are very dim. If your headlights and radio won’t turn on, and your car also won’t start, then the problem is usually a dead battery. Alternate causes: Blown main fuse, corroded battery connections, or other wiring issues. When you turn the ignition key, nothing happens. If the battery is totally dead, you won’t hear or feel anything at all when you turn the key. Alternate causes: Faulty starter, ignition switch, fusible link, or another component. You can hear the starter motor when you turn the ignition key, but the engine doesn’t start. If the starter motor sounds labored and cranks very slowly, or it cranks a few times and then stops altogether, the battery is probably dead. In some cases, the starter may be bad and attempting to draw more current than the battery can provide. If the starter cranks at a normal speed, then you have a fuel or spark issue. Alternate causes: Lack of fuel or spark, bad starter motor. Your car won’t start in the morning without a jump, but it starts fine later in the day. An underlying cause, like a parasitic drain, is probably killing your battery overnight. The battery may need to be replaced, but the only way to fix the problem is to find the source of the drain. Alternate causes: During very cold weather, the ability of a battery to provide on-demand current to a starter motor diminishes. Replacing an old battery with a new one, or choosing a battery with a higher cold cranking amps rating, may fix the problem in that case. No Door Chime, No Headlights, No Battery? Before you ever try to start your car, there are a number of hints you may pick up on that could point toward a dead battery. For instance, if you have your dome light set to turn on when you open your door, and it doesn’t, that’s a red flag. Similarly, if you’re used to a chime associated with inserting your keys while the door is still open, and you don’t hear it one day, that may indicate a dead battery. Other systems that require power from the battery, like the dash lights, headlights, and even the radio, will also fail to work if your battery is dead. In some cases, the lights may still turn on, although they may seem dimmer than normal. If you notice that some things work and others don’t, then the battery probably isn’t at fault. For instance, if your dome light doesn’t come on, and your door chime doesn’t work, but your radio and headlights do, the issue may be a faulty door switch. Does the Engine Fail to Crank or Turn Over? When your car battery dies, the most obvious symptom is that the engine won’t start. However, there are many, many different ways that an engine can fail to start. If you notice that absolutely nothing happens when you turn the key, then you could be dealing with a dead battery. To help narrow things down, you’ll want to listen carefully when you turn the key. If you hear nothing at all when you turn the ignition key, that’s a good indicator that the starter motor isn’t getting any power. When combined with other hints, like dash and headlights that are dim or off altogether, a dead battery is a pretty likely culprit. To verify that the battery is the problem, you or your mechanic will want to check the voltage. This can be done with any basic multimeter that you can pick up for less than ten dollars, although specialized tools like a hydrometer or load tester will provide a clearer picture. If the battery isn’t dead after all, then you may suspect the ignition switch, solenoid, starter, or even something like corroded battery terminals or a loose ground strap. The only way to diagnose this type of problem is to methodically eliminate each of these possibilities one by one. Does the Starter Motor Sound Labored or Slow? If you’ve owned your car for any amount of time, you’re probably pretty familiar with the sound it makes when you turn the key. That’s the sound of the starter motor engaging with the engine via a toothed flexplate or flywheel and physically rotating it. Any change in that sound indicates a problem, and the type of change can help point you toward a diagnosis. When the cranking sound your car makes seems labored or slow, that indicates either a problem with the battery or the starter. The most common cause is that the level of charge in the battery is insufficient to properly operate the starter. The starter motor may be able to turn the engine over, but not well enough for the engine to actually start up and run on its own. In some cases, it’s also possible for a starter motor to fail in a such a way that it still works, but it attempts to draw more amperage than the battery is capable of providing. This will also result in a situation where the starter motor sounds labored or slow and the engine fails to start. If the battery voltage is normal, the battery tests fine with a hydrometer or load tester, and all of the battery and starter connections are clean and tight, then you may suspect a bad starter. Prior to actually replacing the starter, your mechanic may use an ammeter to verify that the starter motor is drawing too much amperage. If you hear other unusual sounds when you try to start your car, the problem probably isn’t a dead battery. Clicking often has something to do with the starter solenoid, or even a bad starter, while a grinding sound may indicate a more serious issue. When a car makes a grinding sound and doesn’t start, it’s usually a bad idea to keep trying to start it. This kind of grinding can happen when the teeth on the starter motor don't mesh properly with the teeth on the flywheel or flexplate. So continuing to crank the engine may cause serious damage. In a worst-case scenario, replacing a flywheel or flexplate with damaged teeth requires removing the engine, transmission, or both. What If the Engine Cranks Normally but Doesn’t Start or Run? If your engine sounds like it’s turning over normally and just fails to start, then the problem probably isn’t a dead battery. You will typically hear a difference in the speed that the engine turns over if the issue has to do with a low level of charge in the battery. So an engine that cranks normally and just fails to start or run indicates a totally different problem. Most of the time, an engine that seems to crank normally without actually starting has either a fuel or spark problem. The diagnostic process can become very complex, but it always starts out with checking for spark at the spark plugs and checking for fuel at the fuel injectors or carburetor. 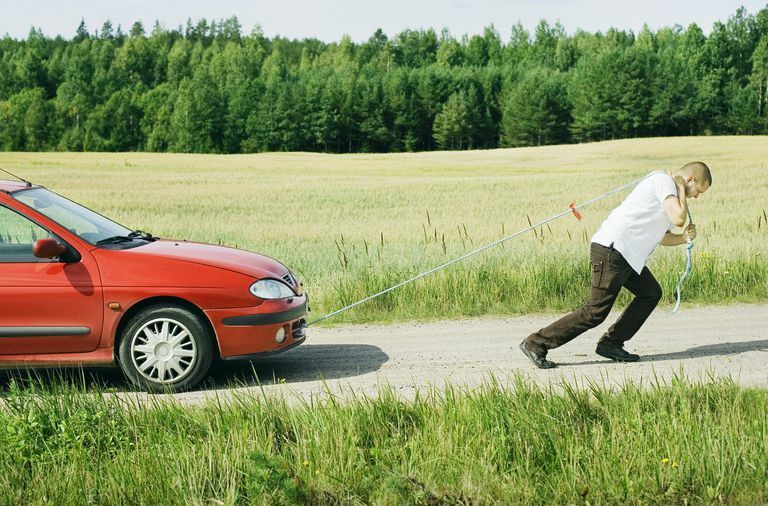 In some cases, even parking on a hill with a near-empty gas tank can cause this type of problem, since doing so may shift the gas away from the fuel pickup. How Can a Car Battery Be Dead in the Morning and Fine Later? The common scenario here is that your battery seems dead, but your car starts fine after jump starting or charging the battery. Your car may start fine all day, or even for several days, and then it suddenly fails to start again, usually after it has been parked overnight. This type of problem may indicate a bad battery, but the underlying problem probably has nothing to do with the battery. In most cases, you’ll find that your electrical system has a parasitic draw that slowly drains your battery down to nothing. If the draw is small enough, you’ll only notice the effect after the car has been parked for an extended period of time. Other issues, like corroded or loose battery terminals and cables, can also cause this type of problem. In any case, the fix is to get rid of the parasitic draw, clean and tighten the battery connections, and then fully charge the battery. Cold weather can also cause this type of problem because excessively low temperatures reduce the ability of a lead acid battery to store and deliver power. If you run into a situation where your car needs a jump start after being parked outside overnight, but it’s fine after being left in a parking garage all day while you work, then this is probably what you’re dealing with. In most cases, replacing your battery with a new one will fix this issue. However, you may be able to locate a replacement battery that has a higher cold cranking amperage rating than your old battery. If you can find such a battery, and it safely fits in your battery compartment, then that’s definitely the way to go. What Really Happens, on a Chemical Level, When a Car Battery Dies? While some of the problems we discussed above actually had to do with a bad battery, many of them were unrelated underlying causes. In those cases, fixing the unrelated problem and fully charging your battery will be the end of it. However, the reality of the situation is that every time a battery dies, it suffers irreversible damage. When a battery is fully charged, it consists of lead plates suspended in a solution of water and sulfuric acid. As the battery discharges, sulfur is drawn out of the battery acid and the lead plates become coated in lead sulfate. This is a reversible process, which is why it’s possible to charge and discharge a lead-acid battery. When you connect a charger to a battery, or when the alternator provides current to it when your engine is running, most of the lead sulfate coating on the lead plates return to the liquid electrolyte. At the same time, hydrogen is also released. The other important issue is that when the voltage of a car battery drops to about 10.5 volts, that means the lead plates are almost entirely coated in lead sulfate. Discharging below this point can permanently damage the battery. It may no longer be possible to fully charge it, and a full charge may not last as long. Leaving a battery dead can also cause serious problems, as the lead sulfate can eventually form into hardened crystals. This buildup can’t be broken up by a regular battery charger or the current from the alternator. Eventually, the only option is to replace the battery altogether. Does Your High End Car Audio System Need a Second Battery? Will an Inverter Drain Your Car's Battery?